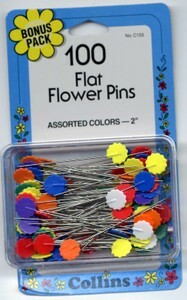 These popular pins are ideal for a variety of uses. The brightly colored heads are easy to see and grasp and may be ironed over safely. Quilters like them for holding stacks of fabric together when rotary cutting. The pins lay flat under an acrylic ruler and keep the fabric layers from shifting. Sewers find the 2 inch length convenient when working with polar fleece and decorator fabric - and for conventional sewing and serging. The heads will not slip through openings in lace and loosely woven knits - and also work well for pin weaving. If you really want to be a pin geek, just pop over to the Dritz website for a complete review of all kinds of pin info.